This is a very ornate Lichid trilobite. 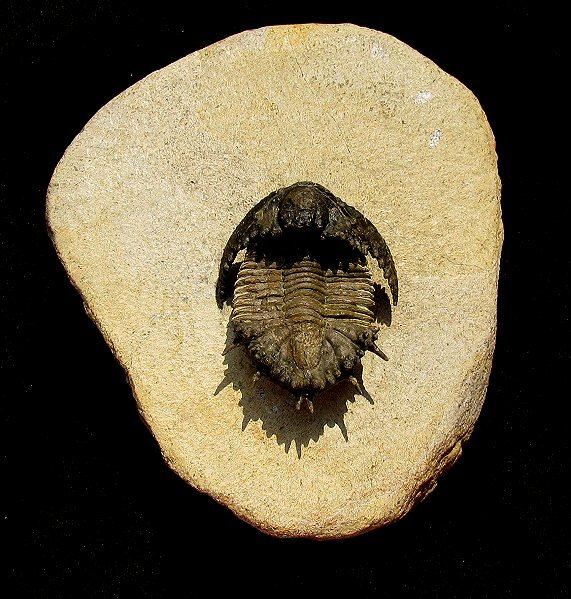 It is the very strange trilobite, Akantharges mbareki, from the Jorf locality in Morocco. This wacky type of trilobite has pustules AND spikes AND spines! This specimen showcases these features beautifully. The inflated trilobite has been painstakingly prepared on a pillar of rock, leaving the entire trilobite fully free-standing. The large spikes and long tailspines have all been extracted free of matrix. The three-dimensional bug is aesthetically perched atop the sculpted limestone block. This is easily one of the coolest new trilobites we have seen from Morocco in a very long time.